Argelès sur mer, Exceptional property! Property panoramic view sea and mountains! It may be a cliché, but applied to Argelès-sur-Mer, it really is true. The town benefits from being situated on the Mediterranean coast, and this means it receives more than the usual share of sunshine. 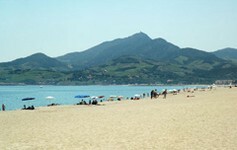 There are lovely safe sandy beaches and the scenery is absolutely spectacular, with the backdrop of the Albenas hills stretching back to the majestic Pyrénées. Families will love the atmosphere of Argelès-sur-Mer, as there is something here for all ages to enjoy. Argelès-sur-Mer is made up of two essential parts, with the old quarter of town being found inland and the newer part, developed for tourism beside the beach. In the new part of town you will find a proliferation of restaurants, some serving really delicious locally caught seafood, and plenty of shops, hotels, apartments and entertainment facilities. A little further away from here there are numerous campsites which become very busy in the summer season. The old section of the town is quite different. Here, instead of modern hotels and apartments you will find yourself wandering in narrow cobbled streets, looking at quaint and colourful houses with their gaily painted shutters echoing the blue of the Mediterranean Sea. The traditional theme is continued by the twice weekly market for which it seems the entire town turns out, and here you can buy the freshest and best of the local produce as well as clothes, waxed tablecloths and other trinkets and necessities! For those with a yen for adventure, this is a wonderful area of opportunity. The geography of the region, with its sea, mountains, lakes and gorges means that you will never be short of a new experience as you try your hand at rock climbing, canyoning, paragliding, horse-riding, scuba diving… the list goes on. There are also many fascinating places to visit all within easy reach of the town. Carcassonne, with its fairytale castle is easily accessed for a day trip, as is Barcelona, the great Catalan city just over the border in Spain. The Pyrenean Mountains, with all their beauty and drama, are less than an hour away by car, and should you be in Argelès in the winter remember there is some great skiing here. The vineyards, which seem to cover much of the countryside around Argelès, provide another interesting opportunity. Many of the local vineyard owners produce their own wines, and operate 'Directe Ventes', where you can taste the wines and take home a few bottles of your favourites. There are numerous airports close to Argelès-sur-Mer, so it will be easy to find a flight that suits your requirements. Perpignan is the nearest, and it is served by budget airline Ryanair which means that access is cheap as well as simple! You could alternatively choose to fly to Carcassonne, also with Ryanair, or look a little further afield to Girona or Montpellier and take in a little sightseeing as part of your trip! Property on the Mediterranean coast is always at a premium, due to the obvious attractions of owning a home in this lovely area. The sunny weather, the warm, calm sea and glorious surroundings all conspire to make this a very desirable property hotspot. It is worth remembering, however, that property here will also bring the advantage of as high rental value, so should you be looking for a holiday home you can recoup some of your costs by renting it out when you are not in residence yourself. Properties available here range from traditional and charming village houses in the older parts of the town to modern purpose built apartments in the coastal quarter, so there should be something to suit most tastes. Argelès-sur-Mer is still a less expensive option for a Mediterranean property than many comparable resorts in Spain, or indeed further east into France's Azure Coast. Do you know Argelès sur Mer better than we do? Do you have photos of Argelès sur Mer? WHERE IS Argelès sur Mer? Argelès-sur-Mer is found in the south of France, on the Mediterranean coast very close to the Spanish border. Access: By air: Fly into Perpignan, Carcassonne or Montpellier on one of the budget airlines such as Ryanair or bmibaby. British Airways and GB Airways also serve Montpellier. You can also fly to Girona in Spain. Economy: Tourism is now the main source of income for the town, although agriculture, namely wine production, still holds a place in the economy. Interesting fact: In spite of the fact that the population of the town increases massively in the summer (there can be as many as ten times the normal resident population in the holiday season!) 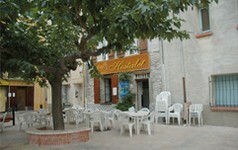 Argelès-sur-Mer still manages to retain its unspoiled charm.